Dr. Victor J. Cid leads SWI@Spain, the Small World Initiative's efforts in Spain. Dr. Cid joined the Small World Initiative two years ago and attended the June 2016 training held at the University of Connecticut. Since then, he has been rapidly growing the program in Spain and has already impact 42 postsecondary institutions and high schools across the country. His team at the Universidad de Complutense de Madrid has been working to translate the Small World Initiative: Student Research Guide and Research Protocols into Spanish. In this post, Dr. Cid shares his experiences starting and growing SWI@Spain. Great ice cream on Campus and a great bunch of people sums up the SWIPIs training experience. We were taught by the safe and steady hands of Nichole and Debra. Everything works, everything seems easy. This is America, a land of opportunities. Trump for President? Ha, ha, who buys that joke! The Small World Initiative is as contagious as it is exciting. A Spaniard among the trainees. Well, that’s me. Back home a small grant from Madrid University is waiting for a pioneering SWI experience through the 2016-17 course. My friend Caroline Jérôme had told me all about service-learning before flying to the States. We thought that only by adapting SWI to service-learning we would be able to meet the aim of waking up STEM vocations in Spain, where the decision of jumping on the science path is made during high school, well before college. We planned to have teams of university students become SWI Teaching Assistants (SWITAs) in charge of coordinating SWI at high schools. An ambitious plan. Cool, though. Time to plan out SWI@Spain. Nineteen Faculty Members from Pharmacy, Veterinary and Biological Sciences are taking a short training workshop and debating on how to deal with the challenge. Professors, Senior Researchers and younger Postdoc fellows: everyone is so excited about the project! They must contact high schools and recruit SWITAs among their third year university students. Will anyone be interested after all? Hectic days: launching our Facebook, blog and webpage, spending all our budget in culture media, disposable gloves and labcoats, cycloheximide, Petri dishes and toothpicks, to name a few shopping items. Overwhelmed by success among our students: 120 SWITAs have enrolled. Third year pharmacy and veterinary students, second year biologists and biochemists, even some master in microbiology students. They are already undergoing training courses in the lab, extra microbiology lab classes: digging for samples around the campus, making dilutions, recognizing different colonies, dealing with isolates and making the antibiosis assays on two ESKAPE dummies: one gram-negative and one gram-positive. That is as far as we can reach. They must master the techniques as they will be responsible for teaching much younger SWI students. The environment is great, and it is antibiotic awareness week! The world famous “They won’t survive” videoclip was shot by Belen Patiño’s students in these training sessions. The response from high schools is no less encouraging. Dozens of schools have applied. We decide to work with 22 of them. It is crazy, I know, we are taking as much as we can afford and that is the absolute maximum. 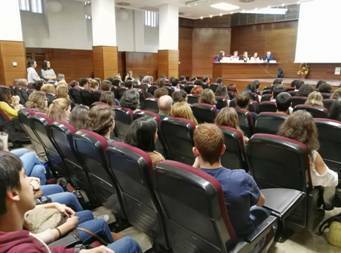 Professor Covadonga Vázquez and her SWITAs are pioneering the experience in a public high school in a Madrid suburb. They are science students from an excellent program. Samples are taken form soil all over Spain. So much to do in just five two-hour sessions in the high school labs! The SWI team is busy carrying material, pipettes, cultures, and all kind of gear from the university to the high school and back. The rest of SWI@Spain team members are following their experience closely. After Christmas, the other 21 High Schools will be hosting SWI at some point. It is our fifth visit, and we are bringing the smelly antibiosis assays from the university incubators in a biosafety-marked container in the trunk of my car. SWITAs are struck by waking up so early, but the kids are in eureka mood: Look! I have a producer! It beautifully inhibits Staphylococcus. That’s nothing! I have three! Excitement is in the air, although some of the kids are down because they got nothing. That’s how science works! These students don’t know yet that two months later they will win their school prize in sciences for their presentation on their SWI experience. Back at the University, we have quite a mess sharing common materials as some visits to high schools by different SWI teams overlap in time. At some point, we were working with 6 different high schools during the same week. I had to make a schedule to make sure that the automatic pipettes, vortex, alcohol sprays, etc., etc., were available for everyone. Please bring back the pipettes before noon or I am doomed! This is the farthest spot SWI is reaching! We were in El Escorial, Aranjuez. We are now bringing the cultures and material from the Complutense campus in Central Madrid to a small town outside the Madrid region. Only the most devoted SWITAs accepted to work that far. But there is a surprise: Julia and her team are with us. They are senior journalism students and producing a professional documentary movie on antimicrobial resistance for their graduation thesis. The SWI students here are equally attracted by audiovisual production and antibiotic discovery. Julia and her team are undoubtedly contributing to communicating our effort and our message and hold a successful premiére in November! It is time to celebrate. Prizes and certificates are ready. Everyone is here for the SWI closing ceremony. And we have a lot to celebrate: we have implemented the most ambitious service-learning innovation project at our university ever, we have visited 22 High Schools where 500 SWI young researchers analyzed over 250 samples of soil. We have collected their surveys, and we can conclude that SWI has indeed fulfilled its goal of involving them in real science. They also understand the AMR topic much better, and they are taking the message home. Moreover, active service-learning did work too. Our 120 SWITAs are also happy with the experience. The bravest among them presented a total of 8 SWI communications and posters at the Undergrad Research Congress the week before, and they and were awarded two prizes. We have now found several dozens of antibiotic-producing candidate bacteria from diverse Spanish soils in our fridges. We have no budget yet to properly identify them, and our star keynote speaker, Fernando Peláez, thinks that finding a new antibiotic in the soil “is like finding a particular needle in a box with millions of needles.” But still, the human value of our experience in building this national branch of the SWI community makes it all worthwhile today. Fernando was in the team that developed echinocandins from a fungus isolated in the Lozoya valley, near Madrid. His talk is highly motivating. If I was a 30-year-younger fellow in this audience, I would want to become a scientist overnight. Moreover, coordinating SWI@Spain makes me proud of having taken that decision, whatever my inspiration was at the time. What now? Feeling like a victorious soldier after the battle, I guess. Proud of my fellow SWIPIs and my little army of SWITAs. Such heroic fighters all of them! But is the war won?? Nope! Neither the one against our politicians' blindness towards science nor the one against superbugs, sadly. So we should be standing for the next battle. We will be at the Scientific Weekend at the National Science and Technology Museum (MUNCYT) later this month. We will also be present at education service-learning oriented meetings. And, more importantly, we will share our experience with European colleagues at the Education Symposium at the FEMS Congress in Valencia next July (thanks Dr. Nichole Broderick for accepting our invitation to the carry the SWI flag at this meeting). But our next strategic plan is to conquer the Iberian Peninsula. Exciting. Now I know how Napoleon felt. I just hope we will be luckier than he was in this enterprise. The plan is to hold a SWIPI training workshop in Madrid parallel to the one at the University of Connecticut. SWIPIs-to-be have applied from Catalonia, Navarra, Aragon, the Basque Country, Cantabria, Asturias, Galicia, both Castilias, Extremadura, Andalusia and Valencia. Merck, Sharp & Dome Spain has offered sponsorship for the workshop, Biomerieux will provide some culture media for free, and if the National Strategic Programme for Antibiotic Resistance is sensitive enough, they should cooperate too. Daydreaming maybe, nothing final. Hold on for a report on the next battle. Pipettes are loaded. MICROBIAL CRAFTS TEAM AMBASSADORS. PHOTO CREDIT: AMIT SINGER. In November 2016, the Small World Initiative (SWI, pronounced “swee”) teamed up with The Centers for Disease Control & Prevention (CDC) and launched “The Do Something About Antibiotics Challenge.” This was part of an effort to encourage students to act in response to one of the most pressing global health challenges of our time — the antibiotic crisis. The challenge was in recognition of the CDC’s 9th Annual “Get Smart About Antibiotics Week,” which ran from November 14th-20th 2016. A group of students at McGill University in Montréal, Canada had an original artistic take on the challenge, which led to the judges awarding the team’s project second place. CROSS-STITCHED "ESKAPE" KEYCHAINS TO RAISE AWARENESS ABOUT ANTIBIOTIC-RESISTANT PATHOGENS. PHOTO CREDIT: ASHLEY CAMPBELL. The challenge, aimed at undergraduate-level students, yielded an impressive number of responses from all over the globe. The projects submitted ranged in kind and scale, running the gamut from a museum symposium (North Carolina State University), through a 3-hour hands-on outreach event (Baton Rouge Community College), to a parody of the classic pop song, “I Will Survive” (Universidad Complutense de Madrid). The outcome of the challenge was remarkable not only because of the breadth of the material covered in the submissions, but also because of the diverse types of projects undertaken by students. One submission highlighted by the CDC judges was the “Microbial Crafts” project undertaken by students at McGill University. A group of student artists designed and created a broad range of microbe-related items and accessories. They then sold these “Microbial Crafts” to other members of the McGill community by setting up stalls around campus, and they set up online sales platforms to reach a wider audience. The aim was twofold: to raise awareness of antibiotic resistance by engaging with the local community and to raise funds for the Small World Initiative. No other submission sought to raise funds for SWI as part of the challenge entry. STREPTOCOCCUS PLUSH: JENNIFER HITTI. PHOTO CREDIT: JOY TSENG. The project was inspired by microbe plushies knit by Catherine Caldwell, then a McGill neuroscience student. Catherine liked to knit, and she created these plushies to give to her mother as Christmas presents as her mother had completed her PhD in Microbiology and Immunology at McGill. As such, the “Microbial Crafts” initially consisted mostly of hand-knit or cross-stitched plushies in the shape of well-known microbes. However, the project grew to encompass laptop stickers, buttons, keychains, and more. PIN DESIGN: ELENA LIN. PHOTO CREDIT: PHIL ZHANG. SWI Partner Instructor Dr. Samantha Gruenheid, Associate Professor and Canada Research Chair at McGill, also participated in the “Microbial Crafts” project, knitting a number of plushies by herself and in collaboration with her daughter. The McGill “Microbial Crafts” team had success in multiple areas: considering the project holistically, Microbiology & Immunology students were able to successfully combine their artistic talents with their drive for academic success, research advancement and community involvement. PSEUDOMONAS AERUGINOSA. PLUSHIE CREDIT: BUSHRA KHAN. PHOTO CREDIT: JOY TSENG. P.S. Did you know that the Small World Initiative’s 4th Annual Symposium 2017 will be on June 1st in New Orleans, Louisiana during ASM Microbe? Six students from McGill’s Microbiology and Immunology department will be in attendance, presenting their research and delivering Microbial Crafts to the SWI community. Hope to see you there! FORCES AVENIR WHOLE TEAM PORTRAIT COLLAGE. CREDIT: JOY TSENG. We are on the precipice of entering a post-antibiotic era, when a scraped knee or common infection may prove deadly for an otherwise healthy individual. Because of antimicrobial resistance (AMR), common and life-threatening infections are increasingly becoming untreatable. This proliferation of superbugs is being seen worldwide. There is a silent epidemic of multidrug-resistant typhoid raging across Africa and Asia, killing 200,000 each year; multidrug-resistant tuberculosis (MDR-TB) has been identified in 105 countries; and the US Centers for Disease Control and Prevention (CDC) announced that more than 800,000 Americans may soon be at risk of acquiring untreatable gonorrhea each year. AMR and the resulting diminishing supply of effective antibiotics are two of the biggest threats to global health today. This is no surprise. Even Alexander Fleming, who discovered penicillin, the world’s first antibiotic, warned of the danger of resistance. Yet, while existing antibiotics are losing efficacy due to widespread resistance, pharmaceutical companies have shifted away from developing new antibiotics in favor of more lucrative opportunities. Each year in the US alone, there are more than 2 million AMR illnesses, 23,000 deaths, and $35 billion in economic losses. Globally, there are more than 700,000 AMR deaths annually. According to an often-cited analysis from the Review on Antimicrobial Resistance, if no action is taken between now and 2050, the true cost of AMR will be 300 million premature deaths and $100 trillion in terms of global gross domestic product. SWI PRESIDENT & CEO, ERIKA KURT, AT THE UNITED NATIONS. On September 21st, Small World Initiative President and CEO, Erika Kurt, joined international leaders, experts, and stakeholders for the United Nations (UN) High-Level Meeting on AMR. This marks only the fourth time in history that the UN General Assembly (UNGA) has addressed a health issue – the others being HIV, noncommunicable diseases, and Ebola. This was a welcome first step for many stakeholders who recognize the UN as the only institution that can summon the necessary resources and global commitments to action necessary to combat AMR. The resulting political declaration reflects the commitment of nations to address the crisis in a unified manner. The declaration, which calls AMR “the greatest and most urgent global health risk,” seeks to spur leaders to action and focuses on recognizing the problem, acknowledging the real causes, and calling for a One Health solution. Countries confirmed their commitment to develop national AMR action plans based on WHO’s Global Action Plan. In a welcome move, there was also a real acknowledgment of the primary cause of AMR – the mass-scale inappropriate use of antibiotics in agriculture (including farmed fish) and humans. While this is commonly understood among experts, it has often been carefully left out of policy. The call for a One Health solution focused on proper antibiotic use, prevention and control of infections, and research and development for new antibiotics, alternative therapies, vaccines, and diagnostics. Prevention and control directives included immunization, safe water and sanitation, and good hygiene in hospitals and animal husbandry. Leaders from Europe continually stressed the need for global controls of antibiotic use in agriculture similar to the European Union model. European Commissioner for Health and Food Safety, Vytenis Andriukaitis, contended that a global ban on antibiotics as growth promoters was necessary. Norway’s Prime Minister, Erna Solberg, shared her country’s insights on how to accomplish this without compromising the agricultural industry in describing how Norway was able to reduce antibiotic use in the salmon industry by 99% through an innovative smelt vaccination program. The existing market failures were also widely recognized by those present as simultaneously encouraging improper antibiotic use, limiting access to essential medicines, and not encouraging the development of innovative solutions and therapies. This culminated in a call for investment in research and development of new, effective, and affordable medicines and therapies as well as rapid diagnostic tests that take into account the needs of all countries. With 13 leading pharmaceutical companies committing to a road map for reducing the overuse of antibiotics by 2020 just ahead of the meeting, there was renewed hope that private industry would take additional steps. In the effort to discover new medicines, during the panel discussion, GlaxoSmithKline CEO, Sir Andrew Witty, recognized that, “There has not been enough fundamental biological discovery. We need to pilot new collaborative systems." Leaders will report back in two years on their progress. There were many calls for action throughout the week, and as voiced by CDC Director, Dr. Tom Frieden, "It is not too late if we respond effectively with global collaboration." While the issuance of this declaration is a major accomplishment and draws attention to this important issue, we must now take action. The Small World Initiative is engaging students, science educators, and the general public to use antibiotics correctly, change other behaviors related to AMR, and help us discover new antibiotics. Our introductory microbiology course focused on hunting for new medically-relevant microbes in soil is now in 167 undergraduate and high school institutions in 35 US states, Puerto Rico, and 12 countries, and we aim to establish a high-throughput screening lab to determine if student discoveries may be medically relevant and move forward into the antibiotic pipeline. Our program provides a way of conducting mass-scale fundamental biological discovery through a collaborative model. We are calling on others to help us multiply our efforts to increase awareness, change behaviors, and crowdsource antibiotic discovery. While AMR has significant global consequences, we understand the key causes and many of the possible solutions to stemming this problem…if we can only act. If you would like to join or support the Small World Initiative’s efforts to take action on AMR, please click here. 2016 COHORT OF NEW SWI PARTNER INSTRUCTORS AT THE TRAINING WORKSHOP AT THE UNIVERSITY OF CONNECTICUT IN JUNE. PHOTO CREDIT: NICHOLE BRODERICK. On the heels of another successful and well-attended Small World Initiative (SWI) Annual Symposium at ASM Microbe, the 4th Annual SWI Training Workshop welcomed 23 new SWI Partner Instructors (SWIPIs) at the University of Connecticut (UConn) in Storrs, Connecticut. New partners hailed from India, Spain, and across the United States, representing Texas, Kansas, Minnesota, Ohio, Maryland, Louisiana, North Carolina, Florida, and multiple northeastern states. The six-day workshop began on the afternoon of Tuesday June 21st and ended at noon on Sunday the 26th and was hosted by Nichole Broderick, SWI Program Director, and Debra Davis, SWI Training Committee Chair. Workshop participants were gracefully received and welcomed by any one of a trio of Nichole Broderick’s graduate students – Danielle Lesperance, Rose Dziedzic, and Beth Ann Bolte. These young ladies were on hand for all experiences throughout the week, providing support for all aspects of the workshop. Workshop activities kicked off with an informative welcome from our President and CEO, Erika Kurt. Afterwards, Science Committee Co-Chair Kristen Butela swiftly got down to business with a presentation on biosafety. Then, the hunt began! New SWIPIs ventured across UConn’s campus to select prime locations to collect their soil samples in search of antibiotic producers. The week of training included interactive presentations on pedagogical topics from previously established SWIPIs, followed by group discussions on how to incorporate newly introduced (for some) pedagogical methods into SWI courses. Participants were placed in working groups based on the similarity of the courses in which they planned to implement SWI; this allowed for meaningful discussions, constructive recommendations, and critique between participants. There were many highlights. Barbara Murdoch (2013 cohort) joined us at UConn and led an engaging session on Backward Design, Bloom’s Taxonomy, and Assessment. In presenting these well-known topics, Barbara stressed the necessity for these methods to be employed when implementing SWI courses. Following the training, she produced a collection of participants' questions and answers for reference. Kristen Butela rejoined us to start a necessary conversation as we evaluate the effectiveness of SWI on our students – the use of Institutional Review Boards. She also delivered a quick lesson in Bioethics. A Q&A session with established SWIPIs via videoconference raised lots of ‘how did you?’ questions, which were expertly answered. Our high school pilot instructor Barbara Fishel (The Hockaday School; 2015 high school pilot), along with SWIPIs from different cohorts – Neil Enis (2013 cohort), Theresa Rogers (2015 cohort), and Elizabeth Roberts (2014 cohort), provided perspectives from the various institutions from which they hail. We were especially grateful for the participation of Barbara Fishel, as 25% of the workshop participants represented high schools; they were encouraged and energized by her testimony of the positive impact of SWI on her students. Thanks to our Social Media and Public Relations Committee Chair, Ana Barral, many participants were convinced to quickly join SWI's social media accounts; our twitter followers increased dramatically while she was still giving her presentation! Todd Kelson, SWI Mentor Committee Chair, joined us wearing his ever so spectacular SWI lab coat (We ALL want one!) and explained the purpose of the successful SWI Buddy-Mentor program. During the training, many hours were spent in the laboratory working with newly isolated colonies and plates of colonies previously prepared by our gracious UConn hosts. Training participants were able to go through all steps of the SWI research plan, including chemical extraction of the antibiotics produced and testing to ensure activity against pathogens. The laboratory sessions allowed those seasoned microbiologists to revitalize their skill set, helped those participants who had not touched an agar plate since college (or ever), and provided those who were unsure about certain protocols to get in a trial run before returning to their institutions. Our UConn hosts treated the participants to a wonderful dinner at Lakeview Restaurant, complete with a fantastic fireworks display (courtesy of a nearby festival) at the end of the night! It was a welcome wind down to a busy, but incredibly informative, and productive week. On Sunday morning, working groups presented their plans for future SWI courses, highlighting any possible challenges they might encounter, as well as giving the opportunity for their newly found colleagues and friends to offer advice and/or critiques to their plans. Overall, the new cohort of SWIPIs left excited, enthusiastic, ready, and confident to implement SWI in their institutions across the nation, and the world! We were pleased to hear workshop participants, including the seasoned microbiologists, repeatedly confirm that they were happy they came. A great big THANK YOU to our fabulous UConn hosts for a FUN yet informative and productive workshop, for keeping our bellies filled, and being so accommodating. To our new SWIPIs – welcome to the SWI family! Debra Davis chairs the Small World Initiative Training Committee and is an Assistant Professor at Wingate University, North Carolina. She is a microbial ecologist, specializing in wetland sediment microbial populations. She has been a SWI Partner Instructor since 2014 and has adapted SWI in several courses for Allied Health, Biology/Environmental Biology, and non-science majors. If you are interested in bringing SWI to your school, please click here for information on how to apply. "This workshop has been one of the very best and most useful workshops I have every attended. This spans over a decade of teaching and attending as many workshops that I was able to get to over this time! Great experience! Great team! Looking forward to start, even if modestly. Proud to be a SWIPI!" "This was a great experience. I feel incredibly prepared to begin. You are amazing!!!" "I have not been this excited about a new project for a long time. Thanks so much for the training and materials and support. It was great! I am looking forward to implementing SWI in every way I can." "I learned so much it is going to take weeks to go through all my notes. The bonds I made at the workshop with people were strong. I am looking forward to communicating with them about our work." "Excellent experience and very well done. Looking forward to implementing the course and to working with the SWI group this year." "It was a great experience on many fronts and I am excited about offering this at my institute." "I was excited about SWI before attending training and am even more excited now. It still feels pretty overwhelming, but I have a lot more information and know-how after attending the training. It was really great to collaborate with other teachers interested in making science real for their students." "Having representatives at multiple levels and institutions was formative. The materials provided are particularly valuable in being able to bring this back to my institution. My view of implementation and usage changed from the training experience. Very excited to move forward with this and show my department how SWI can work for us. Great to be part of this cohort." "Excellent workshop and very informative for instilling confidence to bring this course back to my home institution and have it run efficiently." "SWI is more creative as I thought. The SWI team is open-minded and happy to adopt new ideas, leaving plenty of room to innovate! SWI is flexible: It can be adapted to multiple formats and education levels to get the best advantage of the program in particular environments. The SWI community is really collaborative and helpful, ready to share ideas and experiences anytime! It is not just a project: it is a great human environment. Proud of it!" "The project is very scalable, and I can accomplish my learning goals. The workshop was excellent with so much help offered." "This project is authentic research, "doable", and highly supported with all the wonderful materials made available." "Encouraging to see an organization that is tackling the real-world problem of antibiotic resistance and lack of new antibiotics being discovered. How we as science educators can and need to use teaching techniques such as Blooms, formative and summative assessments to further increase STEM retention." "SWI is straightforward to implement, the community is very supportive community, and my students will greatly benefit from the program." On Saturday, June 18th, Erika Kurt, President and CEO of the Small World Initiative (SWI), sat down with biotechnology entrepreneur Dr. Susan K. Whoriskey, PhD, a leader in the biotech industry, at SWI’s 3rd Annual Symposium held at ASM Microbe in Boston. Whoriskey was a member of the Founding Executive Teams of four Boston biotechs: Cubist Pharmaceuticals, Momenta, Moderna, and PNA Innovations. At Cubist, Whoriskey was a member of the team that was instrumental in developing and bringing to the market Cubicin (daptomycin), a lipopeptide antibiotic active against drug-resistant bacteria, in 2003. Whoriskey shared some tales from the lab bench, the boardroom, and her inspirational scientific career. On July 18th, I had the opportunity to sit down with Dr. Susan K. Whoriskey to share her inspiring story with Small World Initiative students and faculty. Throughout her career, Whoriskey has been creating companies that pioneer scientific breakthroughs to save lives and improve healthcare costs as a member of the founding Executive Teams of three of Massachusetts top successful biotech companies and a recently started fourth venture. In her roles, she has been instrumental in helping bring three lifesaving drugs to the market as well as others that are currently in clinic trials. Of particular note, she shared in detail her involvement with the antibiotic Cubicin (daptomycin), one of the first new chemical classes of antibiotics approved by the Food and Drug Administration (FDA) in over 50 years. Whoriskey has been a Research Fellow in Molecular Genetics at Harvard Medical School with 2009 Nobel Prize recipient Dr. Jack Szostak, a consultant to venture capital firm Polaris Venture Partners, and an Entrepreneur in Residence at the Massachusetts Institute of Technology. She earned a Bachelor of Science in Microbiology from the University of Massachusetts-Amherst and a PhD in Molecular Biology from the Molecular Biology Institute at the University of California, Los Angeles (UCLA). Whoriskey decided that she wanted to be a part of that story, in some way big or small. However, due to gender stereotypes, the scientific community almost missed out on Whoriskey’s contributions. When Whoriskey got to the University of Massachusetts-Amherst, she initially thought that science “would be too hard” and “was for the guys.” She declared a major in journalism having been inspired by Bob Woodward and Carl Berstein’s All the President’s Men. Luckily, her school had mandatory distribution requirements. After having delayed taking her science requirement until the second semester of her junior year, she took a science course for non-science majors, The Microbiology of Cancer, taught by an engaging and communicative genetics professor. This professor exuded the joy and adventure of science, and Whoriskey tapped into something in herself “that had been percolating” and did an about-face. With this new motivation and drive, Whoriskey was able to complete all of her microbiology requirements during her senior year. After graduating from college in 1981 with a degree in microbiology, Whoriskey entered the job market during a recession. Following weeks of radio silence on her job applications, she finally landed two interviews on the same day. One job was with a professor working in a clinical microbiology lab and required repeating the same test every day following a standardized testing protocol, and the second job involved working with a professor at Harvard doing exploratory research on cholera to understand the mechanism of action of the toxin agent causing the disease. These opposing opportunities gave Whoriskey the chance to evaluate her own interests, and in considering the job choice, she discovered she was an entrepreneur at the end of the day. She went for the research position, fraught with ambiguity and uncertainty but none the less invigorated by the challenge, even though it paid less than the other option. She worked there for two years and published her first paper on making monoclonal antibodies specific for cholera toxin. The lab was at Harvard University and had researchers at all different levels – MDs, postdocs, masters, bachelors degree – providing many educational opportunities for her. She was inspired by the work and seeing the MDs come back with pictures from their trips to India and with clinical isolates of cholera for research. So, after having graduated from college without knowing what she wanted to do, just two years later, she knew that she wanted a PhD. In the early 1990s, Whoriskey met with a chemistry professor and a biology professor at MIT. They were forming a company to test some small molecules developed by the chemist against assays developed by the biologist to look for antibacterial activity. This company would become Cubist Pharmaceuticals. As Whoriskey explains, they had to overcome some really big barriers to entry as a company. At the time, all of the big drug companies were moving away from antibiotic development programs to work on more lucrative drug development opportunities. Yet, the problem of increased hospital-acquired drug-resistant infections was already emerging and the trend was going in the wrong direction. Infectious disease was on the rise, and new antibiotics would be needed to treat it. Within two years of starting the company, a number of companies thought about getting back into antibiotic development due to the increase in drug-resistant pathogens. Although Whoriskey’s team was working with good small molecule inhibitors of enzymes in vitro, they were never able to identify a molecule that could pass the outer membrane of the bacterial cells in order to kill the cell. The science worked in that it gave them data they could base decisions upon, but the data was telling her team something important. They needed a molecule that could pass through the bacterial membrane. They decided to listen to the science, stop what they were doing, and try something else. In the hunt for a molecule that could pass through the bacterial membrane, Whoriskey and a team of Cubist experts talked to companies that had stopped antibiotic research to see if there was anything they had stopped working on worthy of further development. That was pivotal. Eli Lilly had run a program where employees brought back soil samples from their vacations, which was legal at the time. (Now, it is necessary to follow rules and regulations protecting plant, animal, and human health and potential soil ownership rights.) Eli Lilly had conducted assays to see what natural product extracts and molecules kill whole cells and had a molecule that fit Cubist’s criteria. The team identified daptomycin, which came from a soil sample from Mount Ararat in Turkey. The drug turned out to be extremely successful and is capable of treating multi-drug resistant Staph aureus bacterial infections (MRSA). Cubicin was one of the first new chemical classes of antibiotics to be approved by the FDA in over 50 years. The drug has been used to treat more than one million patients, and Merck purchased the company for $9.5B in 2014. Under current market dynamics, pharmaceutical companies wish to sell as much product as possible to rake in as much profit as possible. However, excessive antibiotic usage, including unnecessary prescriptions and usage of antibiotics in animal feed to speed up growth or prophylactically, accelerates the emergence and prevalence of antibiotic-resistant pathogens. With this is mind, antibiotics should be treated as precious resources and preserved for cases when they are necessary. It is challenging to square the motives of a for-profit company with the need to treat antibiotics as precious resources. Whoriskey possesses that true entrepreneurial spirit. Instead of identifying barriers and saying stop, she is always looking at how to get around them. This ability to think differently and align with supporters has allowed her to successfully navigate obstacles that have stopped others. Following Cubist, Whoriskey became a member of the founding Executive Teams of two additional top successful biotech companies in Massachusetts – Momenta and Moderna – and she is now working on a fourth one – PNA Innovations. Whoriskey led Corporate Development for Momenta Pharmaceuticals with the goal of expanding access to high quality, more affordable medicines. At the time, there was no regulatory process at the FDA in place to approve a generic version of highly priced recombinant protein drugs or complex mixture drugs made from biological source material. There were only the following routes available: NDA (new drug application), ANDA (amended NDA), and BLA (biological license application), and a 1984 generic drug regulation only applied to single small molecule treatments. Yet, there was a need in the marketplace for generic versions of drugs derived from biological sources, and Momenta had the technology to prove to the FDA that they could make products that were chemically identical to the brand product. By showing chemical identity, the possibility existed that they could skip clinical trials and therefore bring the generic drug to market at a lower development cost and also price the drug lower than the brand. Thanks to foresight and some out-of-the-box thinking, Momenta essentially pioneered the field of biogenerics and achieved the first FDA approval for a complex mixture generic drug, Enoxaparin, to prevent and treat deep vein thrombosis and acute coronary symptoms. It was the most successful generic drug launch ever in the US and saved the US healthcare system hundreds of millions of dollars. Momenta also received FDA approval for Glatopa, a complex generic version of Copaxone (complex mix of peptides), the leading product to treat multiple sclerosis. Now, the company employs more than 300 people and is valued at more than $1B. Subsequently, Whoriskey was senior vice president of technology strategy on the Founding Executive Team of Moderna. Moderna is pioneering messenger RNA (mRNA) therapeutics, a novel technology to develop therapies faster and at lower cost to treat a variety of diseases, including cancer and infectious disease. She helped develop a science and business strategy that raised $450M in investment funding, the largest biotech venture financing on record. Currently, Moderna employs more than 300 people. Onto her latest adventure, Whoriskey is now back working on her fourth biotech venture, PNA Innovations (PNAi). The company has pioneered the invention of novel peptide nucleic acids with potential uses in diagnostics and therapeutics. She is working with the team to apply the technology to human health. Combining her scientific mindset with her entrepreneurial spirit, Whoriskey has worked on every aspect of the drug discovery process starting with the big science idea and seed venture capital to scientific proof of concept and initial public offering all the way through to follow-on financings and FDA drug approvals. whoriskey (second from right) with small world initiative high school researchers from the hockaday school at swi's 3rd annual symposium at asm microbe in boston. She also hopes more males step up to be involved in the conversation of equal treatment of women and share proper behaviors. She has worked with so many capable women in her career that she sees no credible reason why there are not more women in executive roles. She is hopeful that discussions about this are ongoing in society and that in her lifetime she will see these trends reverse. whoriskey (second from left) with small world initiative student researchers from the university of pittsburgh at swi's 3rd annual symposium at asm microbe in boston. TODD KELSON – BIOLOGY PROFESSOR AT BRIGHAM YOUNG UNIVERSITY – AND SIMON HERNANDEZ WITH FIRST MIDDLE EAST CLASS OF NEW SWI INSTRUCTORS IN IRBID, JORDAN. In June 2015, Simon Hernandez and I traveled to the Jordan University of Science and Technology in Irbid and spent 5 days training 7 professors from 6 different universities in Iraq on how to implement the Small World Initiative at their universities. Funding was provided by a Biosecurity Engagement grant to the American Society for Microbiology. The training was much like what we are doing in the USA: all mornings were spent in lecture as we learned about this program and how to design a curriculum around it. The afternoons were spent in lab working through each of the procedures. By the end of the week, most had found antibiotic producers in the local soil and were excited to take SWI back to their country. Since this initial training, many of the professors have been able to implement at their own institutions, and science undergraduate students in Iraq are now searching for antibiotic producers in their native soil. Sometimes, I complain about the lack of equipment in my own lab, but it wasn't until I heard of the dire circumstances under which Iraqi faculty are forced to work that I began to appreciate what I really have. Some have had to postpone teaching SWI at their schools due to budgetary concerns or lack of proper equipment; others have had to purchase their chemicals and PCR primers out of their own pocket money. Yet, despite all of these challenges, the students in Iraq who have gone through the SWI experience are enthusiastic about science and had a great experience in lab. They have even contributed to the vast amount of data that is being collected by undergraduate students around the world. We are all part of a global network of scientists who are addressing a global threat in antibiotic resistance. Our efforts are far reaching both in space and in time. Bravo to all of you students who are making the world a safer place to live in! FIRST MIDDLE EAST SWI TRAINING IN IRBID, JORDAN. NEW SWI INSTRUCTORS GIVE THE THUMBS UP. BETSY ROBERTS (LEFT) – ASSISTANT PROFESSOR OF BIOLOGY – WITH STUDENT LAETICIA IBOKI. IBOKI AND A FORMER CLASSMATE WILL PRESENT THEIR RESEARCH ON A NEW ANTIBIOTIC THIS SPRING ON CAPITOL HILL. A pair of Southern biology students have been selected to present on Capitol Hill their discovery of a type of bacteria that may have valuable antibiotic properties. The students will participate in the Posters on the Hill program, sponsored by the national Council of Undergraduate Research. It features 60 student research projects from more than 300 applicants across the nation. The program will be held on April 19 and 20, when students will offer poster presentations of their work to members of Congress, Congressional aides, and representatives of federal agencies. Jacqueline Mary Desrosier, a Guilford resident who just graduated from SCSU, found the bacteria during an advanced microbiology course last spring. The course, part of a nationwide program called the Small World Initiative, enabled students to isolate soil bacteria in the hopes of finding new antibiotics. During the course, she found this type of bacteria inhibited several pathogenic bacteria. During the summer and fall, she and Laeticia Iboki, a resident of Stratford, performed experiments with this “good bacteria,” and showed that it not only killed harmful bacteria, but also helped tomato plants grow larger and withstand heat stress. Patricia Zibluk, director of the SCSU Sponsored Programs and Research (SPAR) program, said she was elated to learn that the students’ application was accepted in a very competitive environment. SPAR coordinated the application process. “It is a testament to Southern’s growing emphasis on giving our students genuine research experiences that foster their intellectual growth and creativity,” Zibluk said. The Small World Initiative – which is independent of the Posters on the Hill program — is an international undergraduate research collaborative designed to help address the diminishing supply of effective antibiotics through the discovery of antibiotics from soil bacteria. Last spring, more than five dozen colleges and universities – including SCSU — participated in the program. SCSU is taking part again this semester. Sometimes it takes humor to shed light on a serious subject. Use your creativity to create an original SWI-related meme and increase our presence on social media. You must be a current/former SWI student, instructor, or staff member to enter. *Should a student win first place, that student’s SWI instructor will also win a matching award. 1) You must be a current or former SWI student, SWI instructor, or SWI staff member to be eligible. 2) You must follow @Team_SWI on Twitter, like SWI on Facebook, join SWI’s Facebook group (https://www.facebook.com/groups/240023149455464), and/or follow us on Instagram to be eligible for points on that platform. 4) Post your original meme(s) on Twitter, Instagram, or SWI’s Facebook group page. Include your full name and school/institution and the following hashtags: #smallworldinitiative #SWImemecontest #sciencememe. 5) Get people to like and comment on your entries. On each platform where you are eligible, the total number of likes and comments will be added together for all of your entries to get your total score. Any personal likes/comments will be excluded from the tally. The Social Media/PR Committee, Recognition Committee, SWI’s President, and Partner Lead will then review the top 10 entrants with the most points to select the final winner. Don’t be offensive! While we understand that there is sometimes a fine line between what one person considers funny and another person considers offensive, SWI leadership will make final determinations on what is offensive. Any offensive entries should be immediately taken down upon request. By submitting an entry, entrants agree that the Small World Initiative may use, repost, and publish entries. Meme creators will be credited if/when their entries are used. NICHOLE BRODERICK – ASSISTANT PROFESSOR OF MOLECULAR AND CELL BIOLOGY – GIVES INSTRUCTIONS TO SWI STUDENTS IN A MICROBIOLOGY LAB AT THE TORREY LIFE SCIENCES BUILDING ON NOVEMBER 10, 2015. We’re running out of effective antibiotics, and people are starting to die as a result. The problem is so acute that the World Health Organization has declared this week, Nov. 16-22, Antibiotics Awareness Week – but antibiotic discovery is still lagging. It’s a big challenge, but UConn students are taking a grass-roots approach to solving it. In some cases, literally. “I wanted to know what people come into contact with every day. So I took a sample right from under a girl sitting on the grass,” says Sabrina Yum-Chan, a psychology major in a first-year seminar, “Microbe Hunting: Crowdsourcing the Discovery of New Antibiotics,” taught by molecular and cell biology faculty members Nichole Broderick and Patricia Rossi. The seven students in the class, all freshmen, collected soil samples, grew out the bacteria they found, and are now testing them for antibiotic activity. Although it sounds novel, soil mining for antibiotics is a traditional approach. Penicillin was first discovered in mold that had contaminated some lab samples. It quickly became known as a miracle drug. It saved the lives of hundreds of thousands of wounded soldiers during World World II, and millions of people since, and sparked a hunt through molds and soil bacteria that turned up dozens more drugs that were equally effective – for a time. But eventually bacteria became resistant to penicillin. So new antibiotics were developed, but bacteria evolved resistance to these new drugs in turn, requiring a steady stream of new antibiotics to keep sickness-causing bacteria at bay. And since the mid-’80s, new antibiotic discovery has plummeted. Pharmaceutical companies don’t find antibiotics a profitable line of research, as it can take a decade to find and test a single drug to the FDA’s satisfaction, but just months for resistance to appear. Now researchers and students around the world are picking up the slack. The Microbe Hunting class at UConn is part of a global collaboration between students and microbiologists at 109 schools in 32 U.S. states plus Puerto Rico, and eight other countries, including Belize, Canada, Iraq, Jordan, Malaysia, Nigeria, the Philippines, and the U.K. It’s called the Small World Initiative. “The grand goal is to find new antibiotics,” Broderick says. She began teaching the class when she worked at Yale University and brought it to UConn as an Honors seminar when she accepted a position here this year. The students take it because it’s a mini-foray into real research that gives them the opportunity to make their own choices and test the results. The first choice was where to sample. Many students took bits of soil from around campus, but others went a little farther afield. Kristin Burnham took a sample from Farm Creek, an estuary in Norwalk, Conn., where her family lives. The bacteria from Farm Creek grew lustrous, deep red colonies in the lab. Genetic testing showed it to be closely related to Vibrio ruber, a relatively unknown bacteria recently identified in Vietnam. 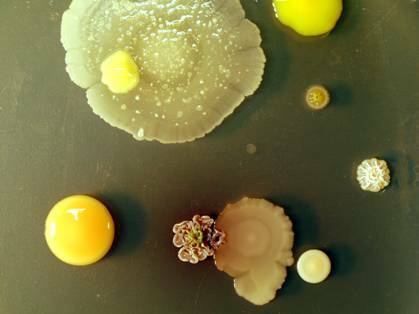 And when Burnham dropped a bit of V. ruber into a plate covered with another type of bacteria, she found it easily cleared space for itself to grow – an indication it was making antibiotics that repelled or killed the other bacteria surrounding it. Every student in the class is now working on extracting the compounds that show antibiotic activity from the soil bacteria they grew. And Broderick doesn’t want their work to go to waste. She is collaborating with the Small World Initiative to develop a chemical hub, a place to send the extracts and bacteria discovered by the students so others can follow up and investigate promising compounds. “For the students to just identify the bacteria [with antibiotic activity] is a good project. But to characterize and test the active compounds can take two or three years,” says Amy Anderson, a UConn professor of medicinal chemistry who specializes in developing new types of antibiotics. That’s why the chemical hub Broderick and other Small World Initiative members are working on is important. “To make those bacteria available to someone else who wants to take that on is really valuable,” Anderson says. She noted that a single genus of soil bacteria, Streptomyces, has in the past led researchers to three different types of antibiotics. Broderick is working with pharmacology faculty in the School of Pharmacy to develop a new course that would allow interested students to follow up on the fall course results. The fall class already takes students through a startling array of chemical and biological lab techniques. And it operates like a real lab. At one point David Knecht, a professor of molecular and cell biology down the hall, wanders through and starts consulting with Broderick and first-year student Jenna Dickinson about different potential assays Dickinson could run on her bacterial samples. Florida Atlantic University Senior Instructor Joseph P. Caruso was chosen as one of 14 faculty members to be trained in the Small World Initiative during the summer of 2014. He attended the weeklong training at Yale University where I first met him. As soon as he returned home to Florida after the training, he wrote me to indicate that he had received permission from his Department Chair to collect data using the California Critical Thinking Skills Test. Indeed, he did collect his own data set and presented his results at the 2015 ASM-CUE poster session. I received a copy of his manuscript that he submitted for publication just a week before I heard of his death. Joe attended the 2015 ASM-CUE meeting along with 6 undergraduates who were enrolled in the SWI lab at Florida Atlantic University. They presented 3 posters at that meeting. He volunteered to be one of the trainers assisting Ana Maria Barral and Debra Davis at the 2015 Training Workshop at National University in California. Those who attended will remember him for his insights and lecture on assessments and evaluation. He taught us many things based on the experiences he had in his own lab. He was chosen to be the "buddy" to 2 faculty members at the University of Belize, and he had begun working to help them acquire a PCR machine so that they could fully implement at their institution. Joe was known by most of the Partner Instructors. He was thoughtful in the questions he asked and the advice he offered. I can summarize his enthusiasm for the SWI by quoting from the application he submitted to Tiffany Tsang to be a faculty implementer. When asked why he was interested in becoming a Partner, he wrote, "I'd like to be able to show non-major students how much fun discovery-based science is and why it's important for everybody." We will miss his enthusiasm and love for science. Thank you, Joe, for reminding us how much fun science can be. The development of antibiotic drugs was one of the 20th century’s greatest achievements, revolutionizing the way doctors care for patients by shifting their approach from a focus on diagnoses without means to intervene, to a treatment-based approach that has saved untold millions of people. But we’ve reached a critical point in treating infectious diseases. At present, the antibiotic pipeline has slowed to a trickle. The reasons are complex but include the fact that many pharmaceutical companies have shifted toward lucrative drugs for chronic diseases and away from acute infectious disease. This, combined with the natural ability of bacteria to evolve and defend themselves against existing drugs, means that a growing number of our most potent medications are fast becoming all but useless. According to the Centers for Disease Control and Prevention in the United States, antibiotic-resistant infections are associated with 23,000 deaths and 2 million illnesses in the U.S. each year and more than 70 percent of bacterial infections acquired in U.S. hospitals can resist at least one of the antibiotics commonly used to treat them. In short, the superbugs are coming and our best antibiotics are reaching their expiry date. But if big pharma won’t save us, who will? “It’s back in the hands of basic science,” says Samantha Gruenheid, Canada Research Chair in the Department of Microbiology and Immunology. Or, more specifically, basic scientists and thousands of undergraduate students around the globe, including 100 or so undergrads in Gruenheid’s MIMM212: Laboratory in Microbiology course. The course is part of the Small World Initiative (SWI), a unique undergraduate research collaborative launched by Yale University in 2013, in which undergraduate students around the world look for new antibiotics in their own backyard. Literally. Rather than rely on individual researchers working independently from one another, the idea behind SWI is to crowdsource much of the initial legwork to a global network of undergraduates to speed up the process. Last semester, the first for Gruenheid’s class in the SWI program, she had more than 100 students collecting and analyzing soil samples. By semester’s end, they had screened almost 2,500 different bacterial isolates – the building block for potential new antibiotics – from the soil. “From that, we had them prioritize – they did tests to see if their isolates had activity against bacteria that are related to the bacteria that are drug resistant in the clinic,” says Gruenheid. In all, Gruenheid and her class have prioritized about 100 of the most promising isolates. These samples have been frozen for further analysis. “Hopefully, we can get them far enough so that companies will be interested in developing them further,” she says. The beauty of SWI is twofold. First, it has enlisted the help of thousands of people around the world to help looking for new antibiotics. Second, it gives undergraduate students invaluable authentic research experience in a lab setting. In support of World Antibiotic Awareness Week, SWI Partner Instructor Alice Lee's students presented posters at the North Carolina Museum of Natural Sciences to the general public. When I decided to implement the Small World Initiative (SWI) on our campus, I had the choice of implementing in an already established course [easily done with all the health profession programs on our campus] or develop and entirely new course. If I am to be entirely honest, due to my own insecurities, I chose the latter and developed a course for non-science majors because I felt if I messed this up, I would not destroy the curriculum, and at the very least, the non-science majors would still learn something. In the fall, I used my microbiology course students as “guinea pigs” and unofficially implemented an abbreviated version of SWI in their lab portion. The students that semester were very excited about doing a research project in class. I never imagined they would be such excited guinea pigs. One particular student [who is now in his first semester of pharmacy school] declared himself embarking on a future career as an epidemiology pharmacist [is there even such a profession??] and became my lab helper in the spring. My experience with SWI in a non-majors course was contrary to my fears. In short – it was quite the challenge, but all in all, it was simply amazing. I had a cohort of athletes in my small class, particularly football players, mainly because my course “fit their schedule.” During the course, the students were inspired to learn; they worked hard, and due to their natural competitive streak, when each assessment was returned, they crowned the “smartest football player” the teammate with the highest grade. At the end of the semester, we had a poster presentation where the students eloquently discussed their findings with invited success coaches, peers, fellow students, and biology faculty. The feedback I received from my colleagues was incredibly encouraging; they were amazed at the work the students completed and how well they were able to explain themselves. Their advisors wanted to know when I was going to offer the course again because the student feedback was so positive. Two of the freshmen students who did very well in my course are now in freshman biology courses because of the confidence they acquired. Most of our isolates were common soil bacteria that are already known for their antibiotic production. Our contribution to the science of SWI was minimal, but…. the student experience was invaluable, and my experience as their instructor was life changing. I am better prepared to offer this course again next spring. I am excited as I have a full class. The word is out on our campus, and the students have been signing up! Who knows what this next group will bring! I learned about the Small World Initiative (SWI) in 2013, through an email sent via the ASM-educator list. The email called for applicants to participate in a training workshop at Yale University and required an application form signed off by a department chair. The deadline was a couple of days away. My colleague, Huda Makhluf, and I had been interested in research-based courses for a while, and thanks to that interest and some frantic emails back and forth, we completed and submitted the application form in time. A few weeks later, we learned that we were selected as one of the pilot partners to come to New Haven. In July 2013, I spent a crazy and inspiring week at Yale with 23 other instructors learning not only the lab protocols and techniques used but also the pedagogic foundations of scientific teaching. We picked and patched colonies from smelly plates, got excited about inhibition zones, could not wait to see the PCR results, and returned to our home institutions with the mission to implement SWI. Most (if not all) institutions that implemented SWI in that first round were very different from Yale. Small colleges, non-traditional colleges, community colleges…both their material resources and student populations do not compare to those of Yale. Over the coming weeks and months, we worked and often struggled to adapt the SWI framework to many different courses and school styles, passing the hurdles of IRB applications and setting up the logistics of lab activities we were not familiar with. My first SWI class was small, only 7 students. They were mainly pre-nursing students, a few were heading to radiation therapy or PA school. They were, as most of our students are, adult working students. Their main goal, which they did not hide, was to get good grades so they could get in the programs of their choice. Some of them were good at the lecture part, asking questions and showing they knew the material. Others were quiet and shy. In the lab, however, things started soon to change. With SWI, there are no right or wrong results, and so some students became really interested in what they were doing. They called each other in the lab to show off their stainings and wondered about the meaning of their results. They started asking questions, and very often, I did not have the answers, just as it happens in real science. I could tell that a couple of students were nervous about this lack of clarity; others, however, started to stand out in their efforts. One of the aspects that I love about SWI is how it empowers students. In that first SWI class, one of my students, a quiet and shy young woman working as a LVN started to produce amazing results. Not only was her lab work impeccable, she was also studying Bergey’s manual and planning her next tests! A few months later, she would be the student representing National University at the ASM conference Presidential Forum. As I watched her glowing by her poster, explaining her work, and interacting easily with scientists and fellow students, I felt almost like a proud parent. The magic repeated again and again with each SWI course. In 2015, the student who volunteered to present her work at the AAAS meeting student poster competition was an older student who never in her life imagined attending a science conference. While one of the original reasons of SWI was to increase the number of STEM graduates, I see its impact on education even broader. To make students (any students!) aware of the challenges and excitement of science and give them the possibility to live it from the beginning to its culmination in a public presentation is a huge value. Our society needs citizens who know and appreciate science, and the world needs more awareness of the antibiotic crisis. It is a win-win for everybody! Recently, I attended a research conference with two of my undergraduate students who were presenting their research results on the Small World Initiative (SWI). I was standing off to the side, and a faculty member from another college who knew I was involved in SWI asked me, “How is the student response to this lab?” This was my answer: A typical lab looks a little like this - Students come to lab and immediately go to the incubator where their plates are stored. They look at their plates and begin telling their neighbors what they’ve found, and they are excited to show off their zones of inhibition. They get their lab notebooks off the shelf and begin recording their observations. All of this happens before I ever start my mini-lecture for the day. Compare this to my old fashioned lab, where students sat at their lab bench quietly and waited until I began to speak. Then after my mini-lecture, they opened their lab manual and followed the directions, step-by-step. They couldn’t wait to finish and get out of there. The Small World Initiative has helped to bring back enthusiasm about science among my freshmen lab students. They comment how excited they are to be doing something that might make a difference for the global threat of antibiotic resistance. They love working in a lab where they get to decide, to some extent, what they will do – and the lab experience is a little different for each and every one of my students. Their excitement energizes me, and I want to be a better teacher for them. Will we ever discover a new antibiotic? I don’t know. But the enthusiasm that my students have for science tells me that it doesn’t matter. They are becoming future scientists who will make a difference. Launched at Yale in 2012, the Small World Initiative (SWI) is an innovative program that encourages students to pursue careers in science while addressing a worldwide health threat – the diminishing supply of effective antibiotics. It centers around an introductory biology course in which students conduct original hands-on field and laboratory research in the hunt for new antibiotics. Through a series of student-driven experiments, students collect soil samples, isolate diverse bacteria, test their bacteria against clinically-relevant microorganisms, and characterize those showing inhibitory activity. This is particularly relevant since over two thirds of antibiotics originate from soil bacteria or fungi. SWI’s approach provides a unique platform to crowdsource medical breakthroughs by tapping into the intellectual power of many people concurrently addressing a global challenge and advances promising candidates into the drug development pipeline. Antibiotic resistance and the resulting diminishing supply of effective antibiotics are two of the biggest threats to global health today. Antibiotic resistance currently accounts for an estimated 700,000 deaths worldwide annually. If allowed to continue unchecked, the number of annual deaths would balloon to 10 million by 2050. For comparison, that is more than the number of people who die of cancer and diabetes combined. Yet, for most, this problem and proper antibiotic usage remain relatively unknown. This problem is further compounded as pharmaceutical companies have shifted away from the development of new antibiotics. SWI is addressing this worldwide health threat by promoting proper usage of current antibiotics and crowdsourcing new antibiotics. To expand its reach, SWI is partnering with the Centers for Disease Control and Prevention and joining efforts with the World Health Organization and others to combat antibiotic resistance through the first-ever World Antibiotic Awareness Week (November 16th-22nd). SWI Partner Instructors and students around the world will be shining a bright spotlight on the antibiotic crisis, what they are doing about it, and how you can take action. While helping to pave the path to antibiotic discovery, SWI is also inspiring the next generation of scientists. “Students’ attitudes on science are transformed, and they are engaged through research with real importance,” asserts Nichole Broderick, Assistant Professor at the University of Connecticut. SWI’s biology course is now in 109 schools in 32 states, Puerto Rico, and nine countries, including Belize, Canada, Iraq, Jordan, Malaysia, Nigeria, the Philippines, the United Kingdom, and the United States. This year, the course is being piloted at the high school level at The Hockaday School, an all-girls school in Dallas, Texas to focus on reaching girls, tapping into a talent pool that is underrepresented in STEM fields. Please consider taking action by sponsoring the Small World Intiative’s efforts. To donate, please contact us. To participate in the global Twitter chat on November 18th, follow @Team_SWI and use #AntibioticResistance and #smallworldinitiative. 1st PLACE goes to Sarah Jeon from McGill University. Congratulations for designing the new cover of the Student Research Guide. Sarah’s work beautifully illustrates the name of our program and juxtaposes the different layers of our mission. Great job Sarah! 2nd PLACE goes to Yun Hsuan (Elena) Lin from McGill University, with a wonderful and surreal depiction of the research journey we embark on at the beginning of each semester. 3rd PLACE goes to Margaret Mass from University of Pittsburgh, which captures the methodology and observations that we are so dependent on for our research. Honorary mention: Mitch Lambert from University of Northwestern – St. Paul, with a meticulous collage of lab supplies and equipment close-ups. Honorary mention: Natacha Maier from McGill University, which displays a fantastic “glow” of microbes living symbiotically in the soil. Honorary mention: Thu Truong from University of Pittsburg, with an impressive hand-drawn synopsis of our research project. Congratulations to all of you on behalf of all the judges! Receiving and reviewing these art pieces was exciting for all of us and we thank you for sharing a piece of your imagination with the SWI community. These are truly imaginative, high-quality, and heartfelt works of art which will shape our vision of the program in years to come. In November 2014 I found myself drenched in rainwater at the Humacao Nature Reserve collecting soil samples—well, more like mud samples. It was my first morning in Puerto Rico and it had been raining since my arrival. But the University of Puerto Rico students accompanying me were determined to fill their conical tubes with soil, at all costs. 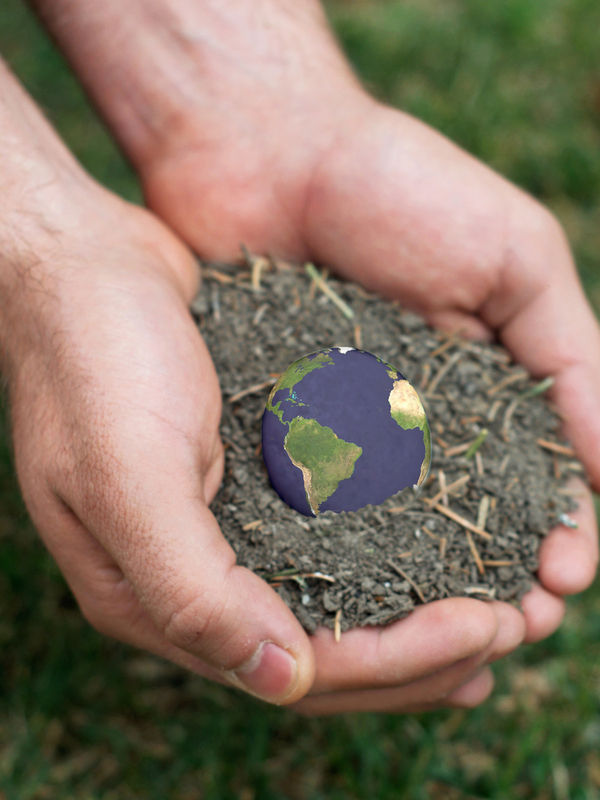 Our goal: to discover new antibiotic producers in the soil.